Back also are Dragon, the enormous spaceborne organism that speaks in riddles and creates havoc for reasons unknown, and Gant, the ECS agent killed in Gridlinked, now a gollem, a human-like android. Sometimes, they are dead humans whose consciousness is transferred into gollem bodies. Cormac is traveling to Masada, a planet run by a brutal Theocracy. They have their own political conspiracies, all designed to keep the ground-based population working in deplorable conditions and a poisonous atmosphere. Unbeknownst to the Theocracy, the Polity is working to get the ground population to vote for Polity intervention. Complicating Cormac’s mission is Skellor, a Polity separatist obsessed with revenge against Cormac and obtaining power. He has fused himself with Jain technology, an ancient nano-technology that remakes anything it comes into contact with. Skellor fuses with a huge Polity dreadnought, the Occam Razor, and proceeds to consume it, a nearby moon, and the crew to become more powerful. Cormac and company escape with unexpected help from Dragon, who is on a suicide mission of revenge against Masada. 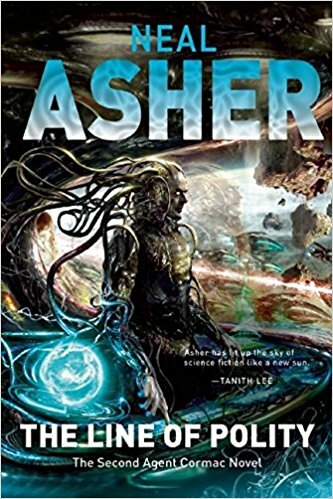 Asher’s space opera differs from many space opera series in that the political situation is complex and nuanced. Dragon, who is definitely a hostile life form, is on its own side. In Gridlinked, he was most definitely an enemy. But Dragon fears the Jain technology Skellor has joined with (hinting that the Jain were Dragon’s progenitors) but loathes the Theocracy. The Polity’s goal of assimilating Masada serves its needs. So does saving Cormac. The Theocracy, corrupt and ignorant as it is, shares a resentment of the AIs running the Polity. And while the Polity’s goals are noble in the long run, there is a need for the AIs to expand power as well as a “runcible culture” to keep happy. But Asher himself is nuanced and complex, a libertarian from England. It informs his work without overwhelming it. And that’s why the Polity Universe has been around as long as it has.